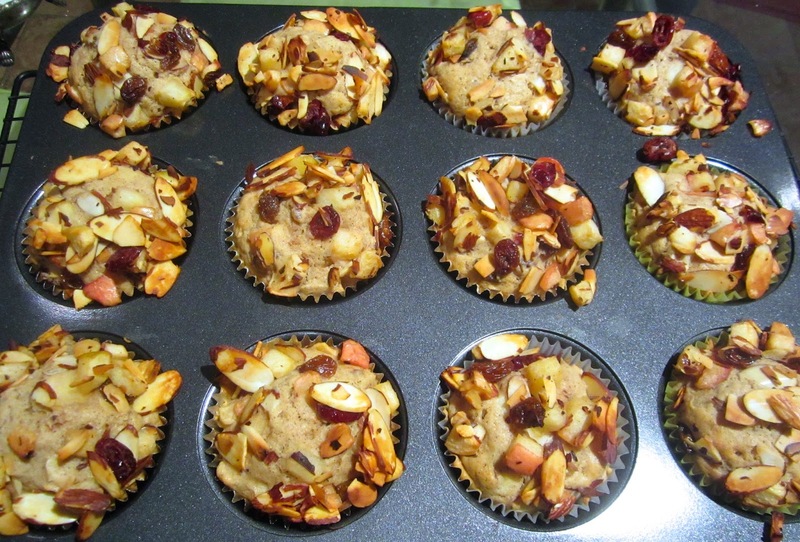 BETTER THAN BAKED APPLES – BAKED APPLE MUFFINS! Karola B. Lütjen (Herzensköchin blog), a nurse and nutritionist, doesn’t only cook from the heart, but, also, for the heart – a healthy one! Her Bratapfelmuffins had been on my to-bake list since last December. 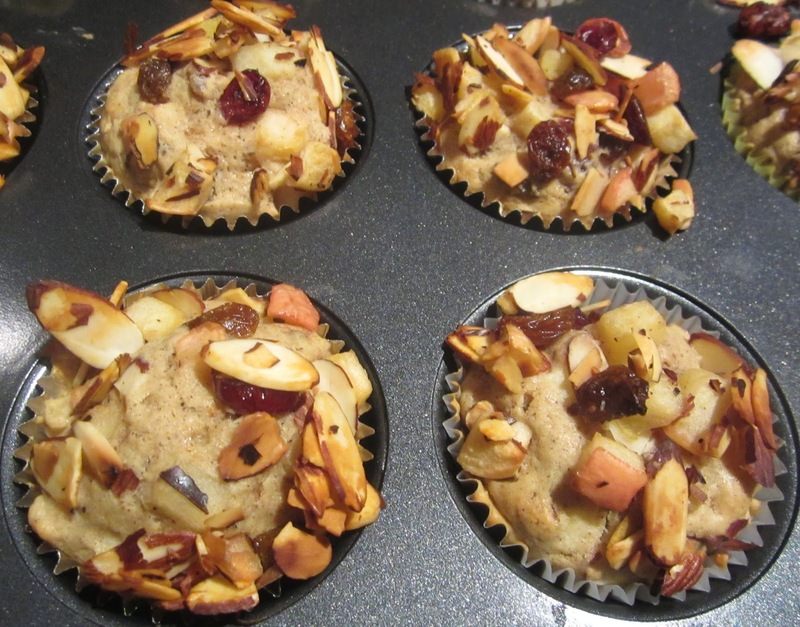 The late fall with its drizzling rain, intermingled with wet snow flakes, made me crave the comfort of something cinnamon-y, with apples and almonds – Baked Apple Muffins seemed an excellent choice. To make the muffins taste even more like baked apples, I sautéd the apple cubes in butter and toasted the almond slices. I also reduced the sugar amount a bit and used vanilla extract instead of vanilla bean. 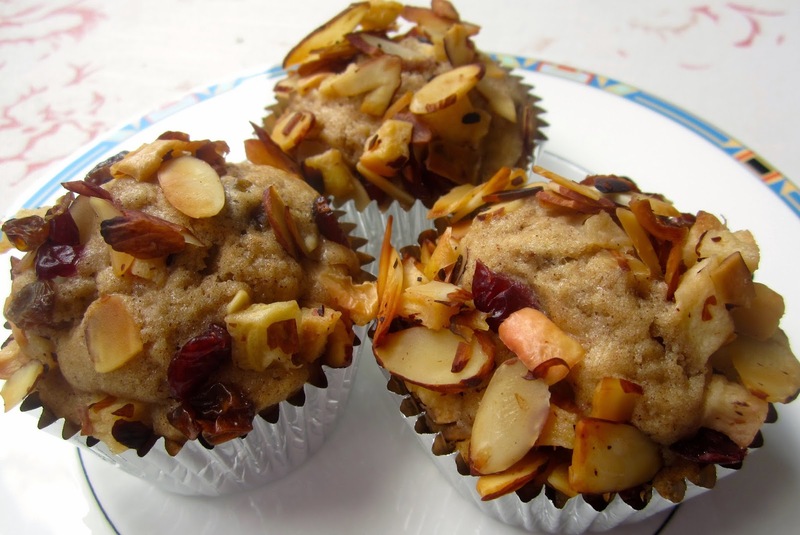 Those wonderfully moist muffins with crispy almonds surpassed all my expectations! My husband found them: “Much better than baked apples”, and I couldn’t agree more! In a small bowl, pour hot cider over raisins and dried cranberries and let them soak for 30 minutes. Preheat oven to 355ºF/180ºC. Line cups of a muffin pan with paper liners. In a skillet without fat, toast almond slices until light brown and fragrant. Transfer them to a small bowl. 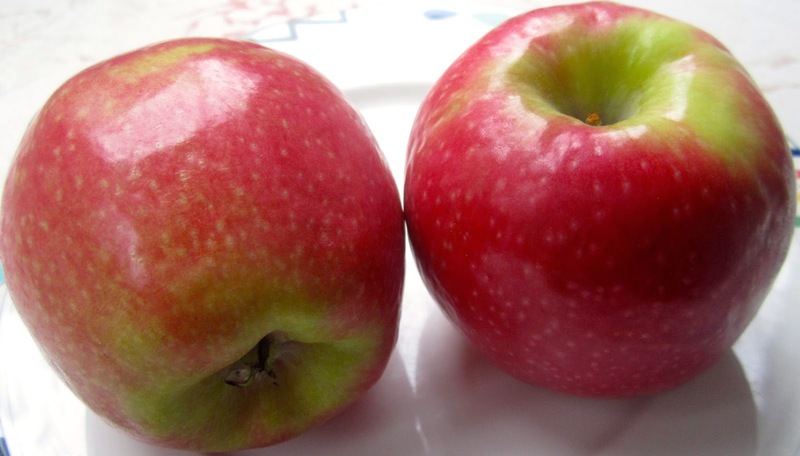 Wash apples, quarter, core and cut into 1/4-inch/1/2-cm cubes. 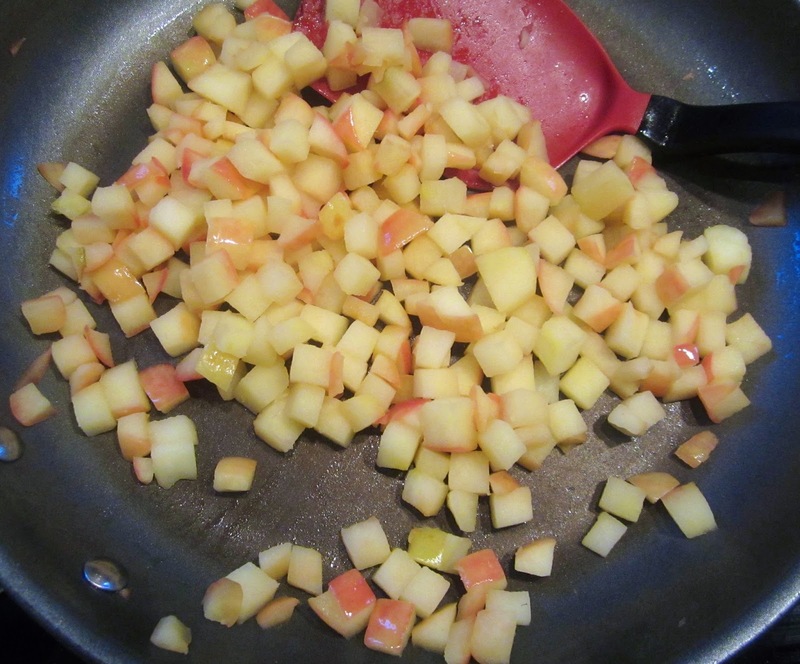 Melt 1 tablespoon butter in the (now empty) skillet and sauté apples until al dente – they shouldn’t turn into mush! In a large bowl whisk together flour and baking powder. In mixer bowl cream remaining 3.5 oz/100 g butter until fluffy, then mix in vanilla, cinnamon and sugar until well blended. Add flour mixture in portions, alternating with the milk, until everything is just combined. Drain soaked raisins and cranberries in a strainer (use soaking liquid for another purpose). 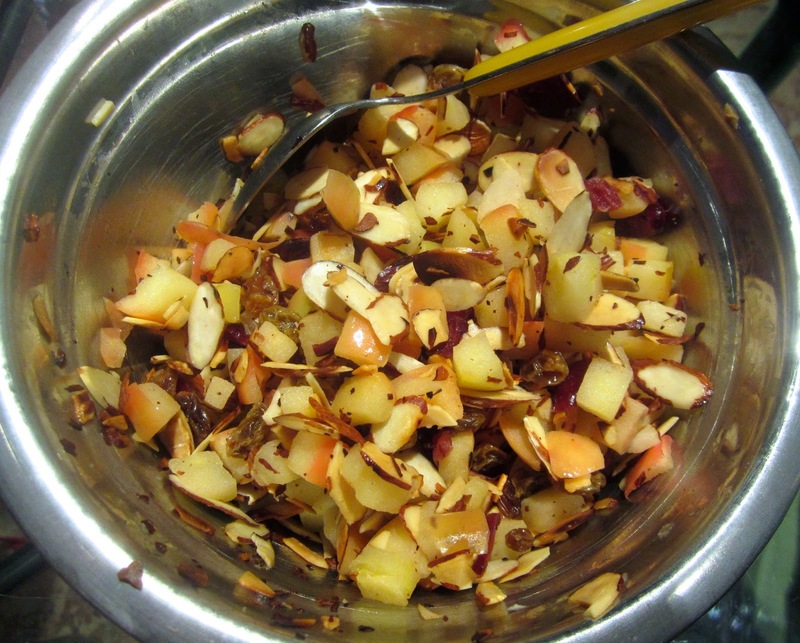 Add with apple cubes to the bowl with toasted almond slices, and mix to combine. 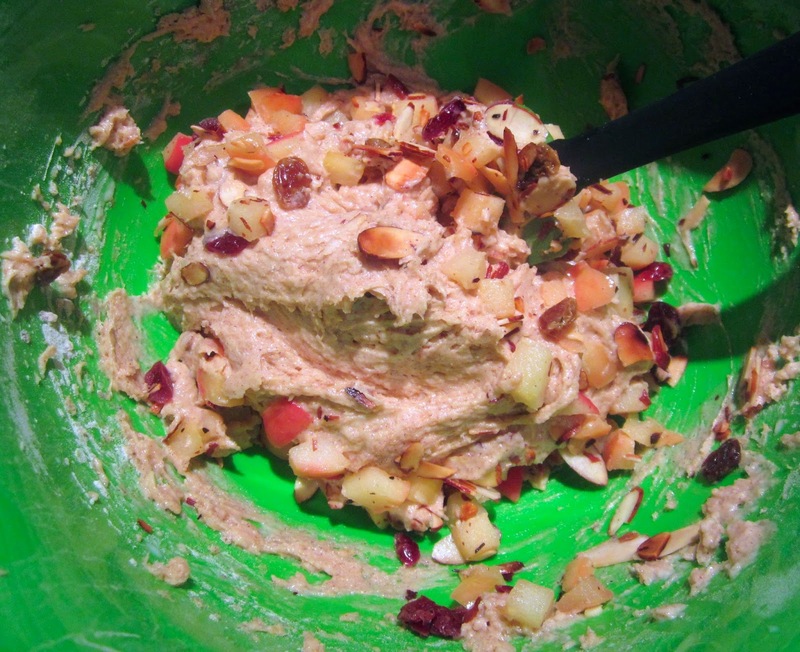 Fold 2/3 of the apple mixture into the muffin batter. Distribute evenly among the paper liners (3/4 full). Sprinkle muffins tops with the remaining fruit-almond mixture, then press gently down a bit to attach. Bake muffins for 25-30 minutes, until tops are light brown, and a needle comes out clean. (Don’t wait for them to turn really brown, then they will bake too long!). Let muffins cool for 10 minutes in the pan, then transfer them to a wire rack. Baked Apple Muffins taste best a bit warm.Thanks to the whole wheat and the juicy fruits they keep fresh for several days (in a cool place).To warm them up, zap them briefly in the microwave. 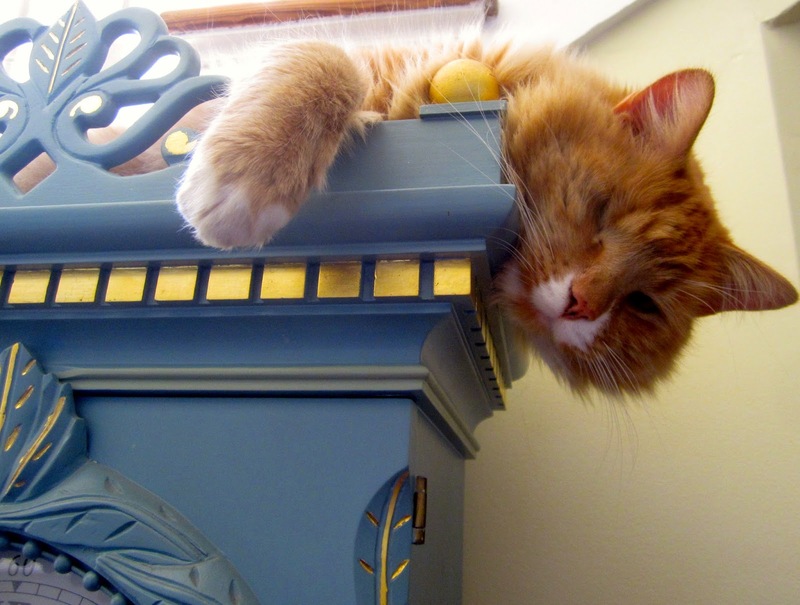 Even Ruffi, the Roamer, likes it better indoors now! WOW, you have 'everything' in there 🙂 will have to try them, thanks. Yes! Do try them, they are really delicious! Oh, I really want to try these! Thank you so much for sharing. You are very welcome, and thanks for visiting, Linda!